Here's another one for the bikepacking crowd. I want to get this one out there early since it's a holiday weekend. 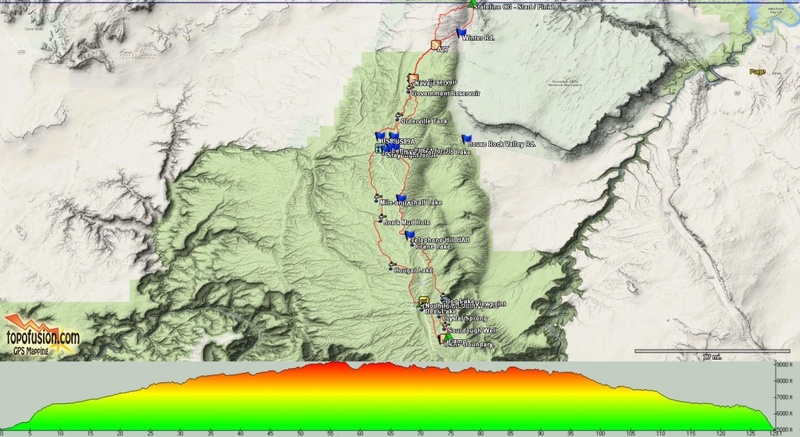 We have a little wiggle room on this route as well, possibly detouring south to check out the North Rim of the Grand Canyon or take a more leisurely ride back to Stateline and camp out on the trail an extra night, finishing early on Monday. I'd like to have some time after the ride to explore the slot canyon at nearby Wire Pass TH. Where: Start / Finish at Stateline Campground on the AZ-UT border. The official end of the Arizona Trail. When: The ride will start no later than 8a on Sat. 9/3. Since it's a long drive north from the Valley, approx. 6 hours, plan on arriving Friday afternoon / evening to camp out. Who: Anyone who wants to come along, has a GPS & knows how to use it, is self-sufficient in backcountry riding and can handle riding about 60-65 miles per day at elevation. -From Flagstaff - take US89 north to Bitter Springs. Turn left onto US89A (towards Lees Ferry, North Rim, Jacob Lake, etc.) Just before the roads climbs up onto the Plateau, there's a lone farmhouse on the right. This is the turnoff for House Rock Valley Rd. (BLM 1065). Turn right and follow HRV rd. for about 18 miles. Stateline CG is on the left, huge sign, can't miss it. HRV rd is well graded, but can get slippery when wet and even impassable if downpours are nearby. I'll keep an eye on the weather leading up to this. Stateline CG is free, first-come, first-camp. Each site is covered & has a picnic table. Restrooms are onsite, but no water!! Plan accordingly. Day 1: We'll ride south on HRV rd then climb up the plateau on Winter rd. to the AZT. Scott & Eszter have been camped near Jacob Lake for a while and have given me great feedback on the forest road portions of this route. So far, everything looks good!! We'll ride south on the AZT on flat-ish terrain to Gov't Reservoir, then resume forest roads up to Jacob Lake for re-supply, i.e. lunch & cookies from the bakery. We'll then take more forest roads south to our camp location on the AZT just outside the Grand Canyon Park boundary. We'll make a re-supply stop at the North Rim Country store just before making camp almost exactly at the halfway point of the ride. 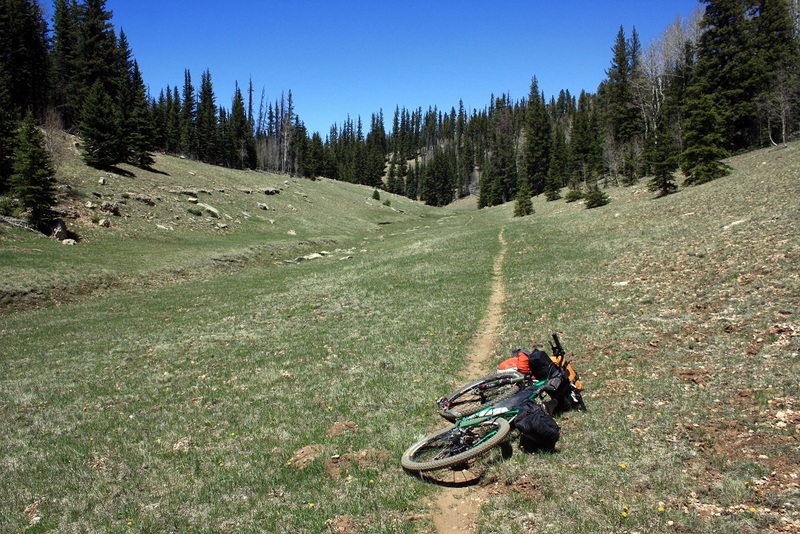 Day 2; Ride north on the AZT all the way back to Stateline on the final 4 passages. These are some of the best in the state, rarely ridden due to their remote location. There are a few short bits of HAB, but nothing to be concerned about, longest one is about 15 minutes crossing a steep drainage. We'll probably detour off the AZT near Jacob Lake for re-supply, then shoot back over to the trail for the last 2 passages. Again, we can decide as a group while out there if we want to extend the ride south to the North Rim. If we do that we'll probably camp near Jacob Lake the second night out. Otherwise we'll finish up Sunday late afternoon or Monday before Noon. Either way, plan on driving home Monday. Correct, no Navajo trail on this one. This is the bike friendly rendition of our ride that was cut short by torrential downpours!! Family could meet you along the way!! How difficult is this for 1st timers? That depends. What are you referring to specifically? First time riding big miles? First time bikepacking with some big ride experience? First time on the Kaibab? More details please. So, let's go ahead & give this a last minute BUMP!! This ride is still going down this weekend. Weather is looking primo too. We have a solid group lined up so far, 10-12 methinks?? Don't be one of those riders who drool over the ride report saying, 'I should've gone on that ride'. Will any of the campsites at State Line hold all of us? Thinking about bringing some wood for a campfire Friday night. It's fairly open up there, if needed we could always grab two side-by-side. The sites at the back of the cul-de-sac may have a bit more room. Sure would be nice if we had the place to ourselves. FWIW the campground was completely full on Memorial day. Doesn't sound like that is typical, but it can happen. I'd love to go, and still haven't made plans for the weekend, but that is a long way to drive for a 3-day weekend. It was a great trip. Lots of fun! Thanks for the report Jeff and I also enjoyed reading your entries about your trip across the pond.